Trying to make some extra money from home on eBay? Looking to declutter your house by selling off some items? Not exactly sure how to sell on eBay? Is selling on eBay worth it with the eBay selling fees? Are eBay Selling Fees Too High? Before we start into the nitty gritty of how to sell on eBay, I wanted to address the question about eBay fees: Are eBay selling fees too high to make money on eBay? In my experience that is a big NO. Don't get me wrong, I don't love eBay fees – after all we are in this business to make money – but I don't think the fees should keep anyone from selling on eBay. For the most part the listing fees are a couple cents, if not free. It's the selling fees that are the highest at 10% of the sale price. That's not just 10% of what item sells for, but it also includes 10% of the shipping costs. People were trying to scam the system back in the day when there weren't any fees associated with shipping. They would post an item for $.99 and the put the full price in the shipping cost to avoid paying the fees. Now everyone pays for this and has to pay 10% of the shipping costs as well. Of course I don't love that we have to pay 10% for both, but I still think it's completely worth it to sell on eBay. We typically cross-post all of our items on Craigslist, Facebook marketplace and eBay, and 90% of our sales come from eBay. It reaches so many more people than the local selling sites. Also, people looking for an item on eBay are usually willing to pay a little more than on Facebook Marketplace, Offer Up and Craigslist. Those sites are known to be yard sale sites, and people are expecting yard sale prices. Of course they are still looking for a deal on eBay, but instead of being willing to pay $2 for a $10 item, they are willing to pay $7. This was just an example, and I actually recommend only doing items that you can make at least $20 on, if not more. Personally I don't think the $5 items are worth the time it takes to list and ship it. Setting up your eBay account is pretty straight forward. , click register at the upper left‐hand corner of the screen. Then fill out your name, email address and create a password. Next, you need to set up your selling account. Go back to the home page and click on “sell” at the top right side of the page. Then it will take you to another page where you will need to fill out your home address and phone number. That’s it! Now your ready to sell! Once you’re ready to list your first item, at the end of your eBay listing they will require you to fill out your PayPal email address. PayPal is a secure way of sending and receiving money over the internet, and you need to have an account in order to buy and sell on eBay. PayPal is an online banking center that receives and stores all your funds from eBay sales. You will need to link an email address to your account and it will become your email address for sending and receiving payments. PayPal also links to your current bank account so you can transfer money in or out. They do this to ensure you have the funds when purchasing items. If you buy something online and use the PayPal account without having the necessary funds, PayPal will take it out of your bank account that's on file. To set up your account, go to paypal.com and click on Sign Up in the upper right corner of the page. Choose a personal, premier or business account. All PayPal accounts allow you to send and receive payments. Personal: Recommended for individuals who shop and pay online, or wish to send or receive personal payments for shared expenses such as splitting of dinner bills or rental charges. Premier: Recommended for casual sellers or non-businesses who wish to get paid online, and who also make online purchases. Business: Recommended for merchants who operate under a company/group name. It offers additional features such as allowing up to 200 employees limited access to your account and customer service email alias for customer issues to be routed for faster follow-ups. For an eBay seller I would recommend the Premier or Business account. (I have a business account). Both the Premier and Business account have seller protection. There is no extra cost to upgrade from personal. There is a 2.9% + $0.30 transaction fee on all transactions. Next, fill out your name, email address and create your password. Then you will need to fill out your home address, and phone number. Now your account is created, and the next page will ask you to link your debit card or credit card so you can start using your account. We are going to go over several aspects of listing your item on eBay below. Here is a great video on how to list an item on eBay. Buy it Now: You can add this option to your auction. It allows your customers to buy the item right at that minute, but for a higher price than the listed price. You can set the Buy it Now price to whatever price that you like, but it has to be at least 30% more than what you are starting the item at. Reserve Price: Placing a reserve on an item means that you have a minimum amount set that the item has to sell for. So you can start the auction as low as a penny or a dollar, and then people will bid it up until it goes out. If your item doesn't hit your reserve, the item won't sell. If your item hits the reserve, then it sells to the highest bidder. No Reserve: This means that you can start your item as low or as high as you want to. Whoever has the highest bid is the winner of the auction for whatever price it ends at. You get to choose the duration of your auction from 1-day, 3-day, 7-day, and 10-day listings. I have used all of them at different times for different items. I personally like the 10 day auction the best. Many people look through eBay on the weekends more often and I like the auction to go through 2 weekends. More recently I have been trying out the 30 day auctions and letting my items sit longer and get viewed by more people. I tend to sell more unique items so it takes the right buyer to come along and see it. The verdict is still out on which duration is better, but for more common items I think the 10 day option is the best still. Under the Schedule tab, there is the option to start the posting immediately or to schedule it for when you would like it to start. If you're wondering if it matters when you post an item, and the answer is YES. If you are a night owl, and post items at 2 in the morning, you limit your audience that will be up to bid on your item when the auction is going out. Most serious bidders will wait until the last minute to bid, and if they are asleep, they obviously can't bid on your item. You want the item to end when most people in your time zone or nearby time zones would be awake. In the Fixed Price format, you will set the price as a Buy it Now price. This means that there is no bidding war, you just set the price for what you want to get for it. In this format you also have the option to accept offers or not. This means that someone can send you an offer that may not be your Buy it Now price, but it might be something you would take. You can decide to accept or decline them. You can choose from a listing of 3 days, 5 days, 7 days, 10 days, 30 days, or leave the item up until you take it down or it sells. You also have the option in the Fixed Price option to post immediately or schedule the post like you did in the auction. In the fixed priced format the timing of the listing doesn’t really matter, because the items can be bought at any time. When you are starting out, I would get the feel for both kinds of auctions and see which works best for you and the items you have. I tend to lean towards the fixed price listings, but recently I ran an auction for a $5 purchase, and was able to make $227 off of them! When you are listing an item, you get to select what type of service you want to use for shipping. This doesn’t mean you have to use that service for shipping the item, but it does mean that is the service you will get the eBay discount through. So if you choose UPS, you can still use Fed Ex through their website or PayPal, but you won’t get the eBay discount and can’t print the label through eBay. I usually choose Fed Ex ground. The reason I choose Fed Ex is because eBay will give a discount for any of the services you choose, but PayPal will give a discount for UPS and USPS. So if I choose Fed Ex, then I can check the discounts for all three and decide which is the best way to purchase the label. Fed Ex usually ends up to be the cheapest, but I’ve had the most problems with them damaging items. (This is where insurance is key! – I always get money back on damaged items.) If it’s a small item, (especially less than 13oz) USPS can be the cheapest. We will cover comparing labels below. There are many ways you can package smaller items depending on their shape. If you are shipping very small items, sometimes you can get away with a small bubble mailer. Melissa has shipped several smaller baby items this way (digital thermometers, kids books, car seat infant head support, car seat cover, etc. ), and used large bubble mailers to do so. I have sold several heart rate monitors and other small electronics that I have been able to ship in bubble mailers as well. Finding boxes for some of the small items is not very difficult, as you probably get some things shipped to you anyway and can start saving the boxes. You can also buy some sizes in bulk from a box store to save some money. For example, Melissa used to make and sell tutus on Etsy. We found the smallest box she could get away with and bought 20 of them at a time. If you don't have the right size box handy. You can always cut down a box to the size you need. Once you have your item packaged, now it's time to print the label. Seems easy enough – which it is – but we don't just want to print any label, we want to print the cheapest shipping label possible. We briefly touched on the different carriers when listing your item. You have three options for shipping when shipping small to medium packages: Fed Ex, UPS, and USPS. 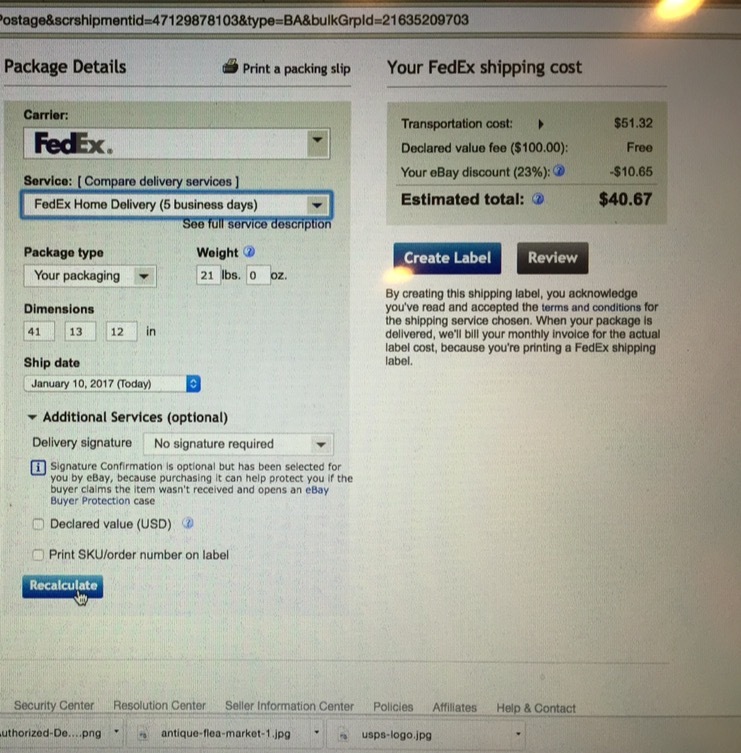 If the item weighs over 13oz, select Fed Ex as the shipping company when listing the item. If it is 13oz or under, list it with USPS. This doesn't mean you have to ship through those, but it usually will be the most cost effective to do so. I still always check all three carriers when I am shipping an item, because depending on size and location, one company will be cheaper than the other, and you never know if PayPal or eBay will give the better discount. It sounds like work to check all three each time, but once you know where to look it only takes a minute or two, and can save you several dollars or more on a larger item. Once you click the print shipping label button in eBay, then it will take you to a screen to input your box dimensions and weight. 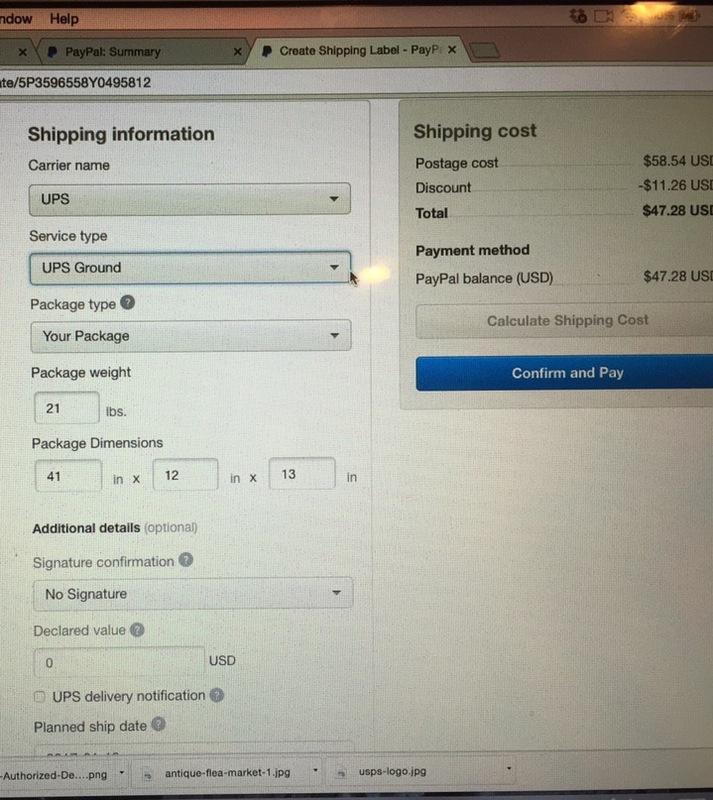 Select a shipping carrier with the dimensions and check out the cost. Here is one from FedEx. You can also check the shipping cost through PayPal. Find the transaction and click ship item. Here is the same item, but checked UPS through PayPal. So in this case the discount through eBay was a little smaller than the one through PayPal ($10.65 vs $11.26), but shipping through FedEx was still cheaper. The discounts and services change depending on size of item and shipping location, so it's always a great idea to compare prices. As much as you may try to prevent it, negative feedback can happen. Sometimes people new to eBay don't know all the rules or proper etiquette, and might give you negative feedback for something so minor that could have been resolved if they had just told you about it. Some people don't understand the amount of weight put on the feedback remarks from eBay. It's higher than any other online seller's rating. If you see a person with 97% on Amazon does that stop you from buying the item? No. What about eBay? Does that same 97% help you go through with the purchase, or make you stop and think if you should continue? Most likely you will research through their recent sales transactions before you decide to make a purchase or not. Here are a couple steps you can take to fix your negative feedback on eBay. If you actually deserved the negative feedback by being dishonest, then sorry my friend, there is no help I can offer you. But I am assuming since you are hanging out with us, that you are an honest seller, so here are a few things you can do. Contact the buyer and try to rectify the situation. It may sound obvious, but a quick e-mail may be all that it takes to get that feedback fixed. If the item is broken you can offer a refund in exchange for them taking off the negative feedback. You can do a full refund in two ways: where they get the money back but have to ship the item to you, or they keep the item and get the full refund. This will depend on the cost and size of the item. Now, if the item is damaged in shipping, that is a whole other issue. That is an insurance claim through the shipping company, so nobody will lose out money in that situation. If the item is ‘not as described', and the buyer thinks it's in worse condition than it arrived in, you could offer either a partial refund, or let them return the item. This is why taking good pictures is essential. You should take good pictures with a solid background and good lighting to show off your item, but you should never try to hide any imperfections. Take an individual picture of any stains, rips, tears, missing pieces etc. If you do this then you drastically reduce people who would be unhappy receiving your item. You want your customers happy! You are a business owner, and you want to have great customer service. With that said, there will always be people who try to take advantage of the situation. Some people always looking to get something for nothing. These people are the minority, but they are there. I work with them the best that I can, and if we can't come to an understanding, then that brings us to the next step. Call eBay to Get Them To Rectify The Situation. If the buyer doesn't respond to your e-mail, the next thing to do is call eBay and ask for their help. Explain the situation to them: How they gave you negative feedback before contacting you, and you want to make the situation right to get the feedback taken off. This one can get tricky sometimes because it might involve calling more than once. If the first time you don't get someone that will work with you, than just call back a little bit later. The call center that deals with feedback seems to have a little more knowledge and ability to help than just the normal eBay customer service. Always be polite to the agent and state your concerns. You're a lot more likely to be successful if you are nice, than if you get angry and show frustration with them. Believe me, I have tried both ways. Be kind, and be persistent. Think about a child. The first time they ask for something and the answer is no, it's definitely no. The next time, it's still no. The third time the parent is thinking about just giving in because they don't want an argument at the moment, and the next time it's a win for the child. I am not saying it will take 4-5 times to win the case. I am just saying to not give up if it seems like they can't help you. Some agents have more experience than others and know exactly what to do and how they can help. Keep calling back until you get one of those people. While you will never be able to prevent it fully, there are a few things you can do to lower your risk of receiving negative feedback in the beginning. –Be completely honest with your listing. Never try to make an item sound like it is in better condition than it is. You can state all the good things about the item, but you also have to state all the imperfections so the buyer has realistic expectations. –Take great pictures. eBay allows you 12 pictures. So be sure to use as many of those as you can to show all sides of the item, and any imperfections that it might have. –Communicate with your buyer. If your buyer asks you a question, be fairly quick to respond. Don't let it go days without responding or they may get upset if they can't get certain info from you. They might have paid you and are wondering when the item will be shipped. If you don't respond they think you are not sending it! Which brings me to my next point. –Ship items promptly. Amazon items can be delivered in 1-2 days typically (and sometimes same day! ), so fast shipping is going to help your buyer want to give you positive feedback. I write in my ads will ship in 2-3 business days and try to get them out sooner. That way I have given myself enough time, but they buyer knows I shipped it fairly quickly (They get an e-mail notification once the shipping label is printed). –Give positive feedback. You can give positive feedback to buyers as well as they can to sellers, and it can help encourage the buyer to give you positive feedback as well. The one difference in the seller/buyer feedback is that sellers cannot give buyers negative feedback anymore. Only buyers can to sellers. It is not really a fair deal if you ask me. Some buyers are tough to work with and deserve to be warned about and have negative feedback (such as non paying bidders). EBay changed this a couple years ago because so many people were giving each other negative feedback. I am not sure this made the situation any better, because it gives a lot more power to the buyers, and they know it. So now as sellers we just have to be more proactive to give the buyer a good experience. So that is how to sell on eBay in a nutshell. I hope this information helps you get started on your eBay journey! If you want to dive in more, we have a free introductory 5-day e-mail course that you can join in here. This is not a full course like our Flea Market Flipper University, but it is a great place to jump into this reselling thing. Flea Market Flipper University is the place for all things eBay! We cover everything from sourcing your items, eBay SEO to freight shipping, and everything in-between. Check out to see when the next class opens. You can download this post to save for later. This will add you to our flea market flips and eBay tip updates that we send 1-2x per week. You can unsubscribe anytime. Many people like to sell on eBay AND Amazon, so if Amazon intrigues you as well, our friends over at The Selling Family have some fantastic info for Amazon FBA sellers. Personally we have never tried to sell on Amazon, and it's a question we get fairly often, so we found the Amazon selling experts to give you the info you need. I grew up in Central Florida and have lived here my whole life. I first got into buying and selling items when I was 16 years old, and have been hooked ever since. It has mostly been a hobby that makes some extra cash, but sometimes it serves as my main income as well. I don't plan on stopping any time soon. I find too many fun toys for my family (or myself), and just love the whole process. Hey Josh! Thanks for your comment! Did you get my e-mail back to you a few weeks back? That’s a tough one. It’s something that will take the right person to find. I wouldn’t give in to the low offers yet. If it was appraised at $21K I would start there. You may get some good offers if you keep it listed. I sit on some of my larger profit items for a while, but when they cash in it’s a great day! If it sits for too long, parting it out may be more worth while. Thanks so much for sharing this article. I have wanted to sell on ebay for a long time. You have answered most of my questions with your guide.